A bedtime discussion brought a family resolution to the lingering question, what can I tell my friends? With that, this note was composed. Tears were shed and my brave girl read this aloud to her class. 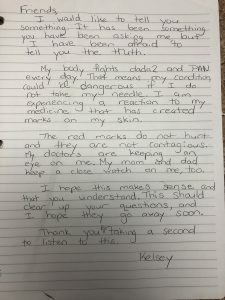 Author New View for PANPosted on September 25, 2018 September 26, 2018 Leave a comment on Dear Class..
We have been awaiting news and answers to the new lesions appearing to multiply and invade Kelsey’s skin. Marks seemed to multiply rather than fade and new fears crept into our minds with each new spot. A difficult realization was that the very cause of these marks could have been potentially avoided. We are grateful for all doctors who care for our daughter and feel incredibly proud to know they are on our team. However, sometimes a team disagrees and decisions must be made. Two years ago, a discussion of antibodies developing from humira was broached. It was shut down almost as quickly with opposing schools of thought. Two years almost to the day, the marks reveal antibodies are causing the lesions. The very trusted medication that does so much good for our daughter has also decided to work inside her as an opposing force this time. We’ve felt anger and anxious throughout the past few weeks. But on we must go, though the marks still look fierce and on we must go, adding new ways to correct and change course. Our quest for more information and more answers remains strong and our understanding wanes. The story behind the smile… the story behind the photo is one of a child with a rare disease on the first day of school who found excitement covered by fear. In this photo, large red lesions covered the skin of an otherwise smiling face and joyful young woman. A sweater on the 92 degree day was worn to mask the red posts along with high socks and a long dress strategically placed around the worst of them. Her positive and calm demeanor were met with anxious feelings and fear about what the other children would say if they saw. She told kids they were bug bites. Then she was sick of that story so she said they were rug burns to others. Overall, she was scared. She told a story because she did not want to get into her disease with everyone (so she said). 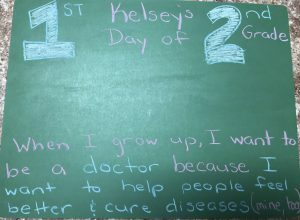 The lies she had to tell others to feel confident on her first day of school were challenging to hear as a parent. Consequently, the parents of a child with a rare disease felt anxious and were at a loss for words. Their brave child embarked on a new year in a way they never experienced before. Sometimes the smile a child is wearing is not reflective of the feelings they face inside. The story behind this photo is one we will not forget, but one we are proud to share to remind us all to share a kind word to make someone’s day. You never know what is going on behind the smile. Ever hopeful for a year with pure joy and excitement, we go to bed with more inexplicable marks and a child afraid for anyone to see them. A morning dose (we pray) will do the trick as we send her off to second grade. We pray her day is a joyful one. We hope her dreams come true.